As a non-profit, we depend on the gifts and generosity of others to function and continue to run as an organization. On days like today (North Texas Giving Day), it is easy to bring awareness to giving. But why do we give? Does it actually help? What is in it for me? These are questions I have asked myself many times, especially as a poor college student who had a desire to be generous but barely had money for all the fast food and shopping trips that occurred. That’s when I realized – it shouldn’t be about me, but giving does benefit me in a strange, backwards kind of way. You probably have experienced the fuzzy feeling you get when you give a gift to a loved one, when you hand a $5 bill to the lady who needs a meal, or when you participate in a mission trip or service project and give of your time. You know that you gain moral and personal satisfaction from a warm smile, sincere thank you and the knowledge that you helped someone who was not able to help themselves in that moment. Sounds good to me! By helping others, you are also helping yourself. But what if I don’t have money to give away? The great thing about generosity is that it doesn’t have to involve a pocket book! For my husband and I, we try to give generously when we can and have set aside funds for a couple of ministries. However, as a young, newly married couple, sometimes giving of our time and resources is more realistic. We might not be able to financially change a teenager’s life, but we can volunteer with a local youth group and give our time. 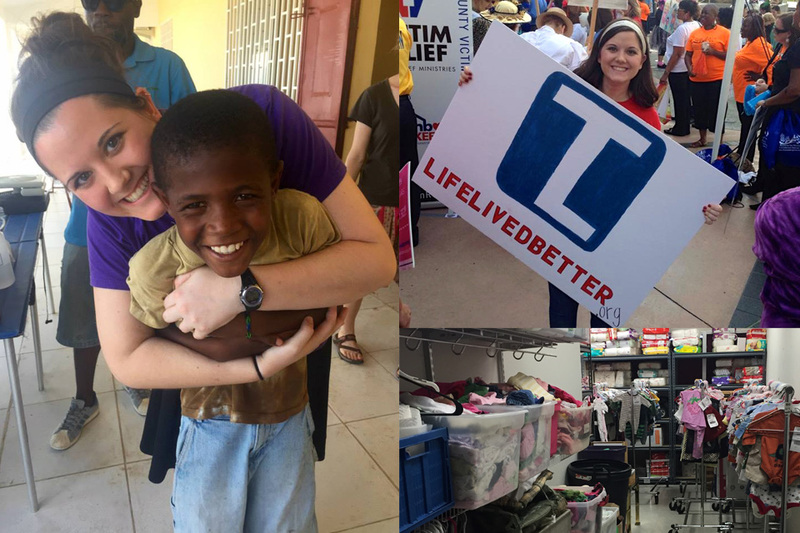 We can’t clothe the nation of Haiti on our own, but we can donate shoes, food, time and other resources through mission trips. One is not better than the other, but there are at least 3 major ways that you can be generous today! Being generous with your time can mean countless things! See someone stuck on the side of the road? Pull over and help fix that flat. Set aside time to tutor students after school. Visit your local food bank and stock shelves. Find a mission trip that serves a population you are passionate about. Mentor teenaged parents through Teen Lifeline. Sometimes, time and selflessly investing in the lives of others can change a life in ways money alone cannot. Have you been thinking of holding a garage sale, but the organizing is too much, it is too hot to sit outside and you know you won’t even make that much money? Consider donating items to a local non-profit or charity that will see those items get into the hands of people who need them. Donating clothes, shoes, food, school supplies, toys, furniture, cars and other material goods can get them off of your hands and into the home of those in need. Money is not the only way to be generous, but it is an excellent way to give to others! This could be a yearly donation to your local church or non-profit, perhaps you contribute to a fundraiser or run in a 5K, or maybe you have decided to sacrifice 2 cups of coffee a month and have committed to giving $10 each month. Whatever the amount, whichever organization, your money, sacrifice and generosity can be used to help and encourage others. As I said at the beginning of this post, North Texas Giving Day is an excellent excuse to give generously, and you can find Teen Lifeline’s donation page here. There are other great organizations that you can generously give to, and we encourage you to find some way to benefit others (and yourself) by living generously! If you are looking for an organization to help, a place to volunteer, a non-profit to take your money and use it to directly affect the lives of other, visit our “Get Involved” page and see if Teen Lifeline is a good fit for you! Don’t wait until you have more money, time or resources – there is never enough of any of those things – but choose to use what you do have, however small, to impact those around you! If you would like to support Teen Lifeline for North Texas Giving Day and take advantage of our $20,000 matching fund, please visit and give here to double your donation and help teenagers live life better!